BK’s offers a huge range of all you favorites both ready to go or cooked to order. This Menu represents our most commonly wanted products so don’t be afraid to request other products. We can provide healthy options both as takeaway or dine in. We can also cater for your function and event. We will work with you to establish a menu that will meet you individual needs. Please call Tegan on 0356332131 for further information. See our specials page for some great family deals. 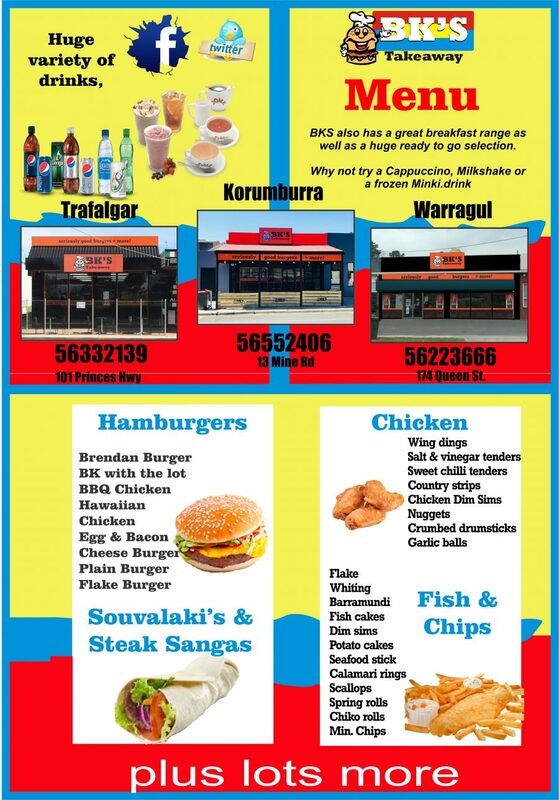 BKs also has a mobile Food Van that services work sites in and around the Warragul area, If you would like us to visit your site please give us a call.